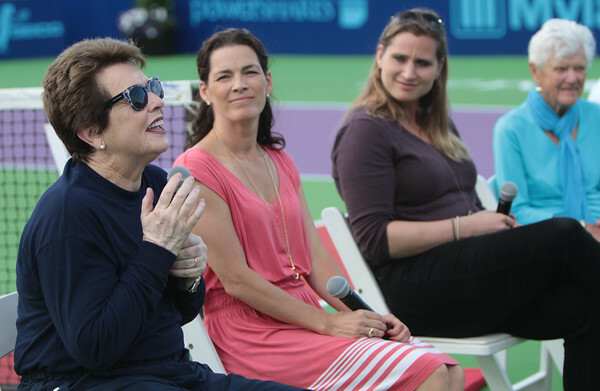 Nancy Kerrigan, Angela Ruggiero, and Avis Murray listen as Billy Jean King speaks during “A Salute to Strong Women” on Wednesday, July 22, before the Boston Lobsters match against the Philadelphia Freedoms at Manchester Athletic Club. The event was to inspire girls to pursuit their dreams. Panelist from left to right were Billie Jean King, Nancy Kerrigan, Angela Ruggiero, Avis Murray, Kelly Schetzsle, Joan K. Norton, and Salem’s mayor Kimberley Driscoll.